Open end, closed end, coil, vislon, #3, #5, what does it all mean? How are there this many options for zippers? When choosing the right zipper for your project there’s a lot to consider, and there are some terms you may want to familiarize yourself with before making a decision. 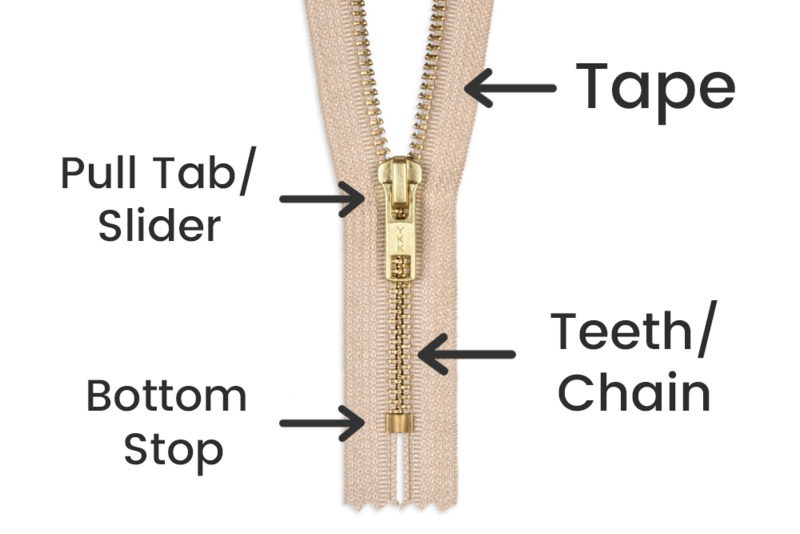 Let’s start with a basic breakdown of zipper construction. A zipper is essentially two strips of nylon tape held together by a chain made of interlocking teeth. To open or close the chain, there’s a pull tab/slider. At the top and bottom of the chain, there’s a “stop” that keeps the slider from going off the chain. There’s often a small extension of tape at the top and bottom of the zipper. 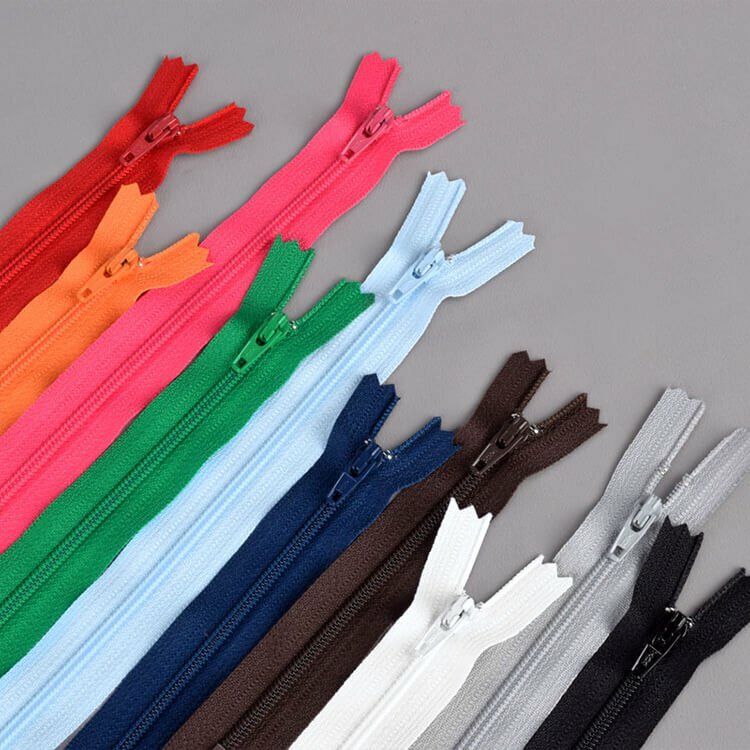 You may have noticed that there are lots of variations of zippers. They are often broken down into apparel, craft, and décor zippers, but there’s a lot of overlap. Just because a zipper is labeled a craft zipper doesn’t mean it can’t be used for apparel, and vice versa. Instead I’ll categorize zippers based on stop type, chain type, and length. At the bottom of a zipper, you’ll find a stop that keeps the slider from going off the zipper. This is either an open end stop or a closed end stop. 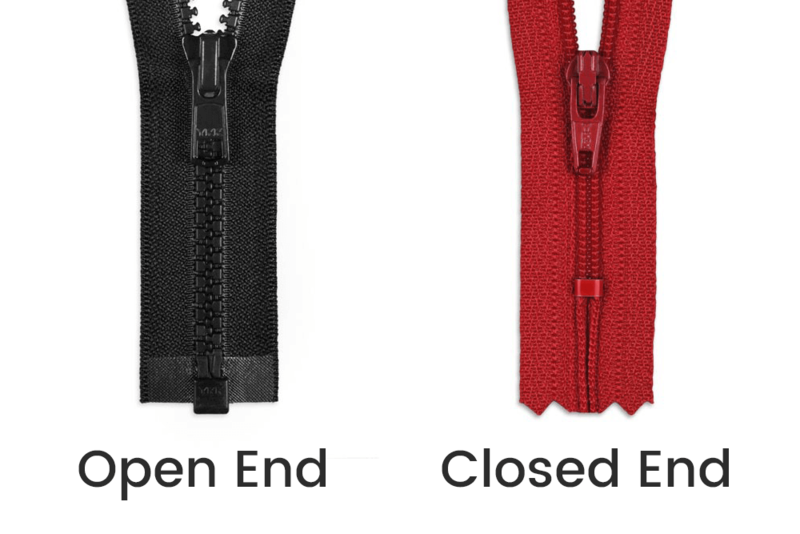 Open end stops allow the zipper to be opened while keeping the slider on one end of the zipper. If you’re making a sweatshirt or jacket, you’ll want an open ended stop so the front of the garment can be opened. If you’re making a zipper pouch, or a box cushion, you may want a closed end zipper. Holding the nylon tape strips together are rows of teeth that interlock to create a chain. There are 3 types of chains: coil, vislon, and metal. Coil chains have small teeth and are generally the most flexible. Vislon chains are also plastic with larger teeth, less flexibility, and more durability. Metal chains have metal teeth (shocking!) and are strong and durable. There are two numbers that appear in the names of all types of zippers. The first number is usually the zipper length. If it says 9″ in the name, it’s 9″ long. What length zipper to buy depends on the size of the project. Of all the variables that go into zipper purchasing, length is probably the easiest decision. The second number, preceded by an actual number sign, tells you the width in millimeters of the chain. So a #3 zipper has a 3mm wide chain, and a #5 zipper has a 5mm wide chain. The #3 will be more flexible than the #5, but not as strong. Now we can break down the name of a zipper and know what it means. Let’s see an example: “YKK 18″ Chrome Gray #3 Closed End Zipper”. YKK is the brand, 18″ is the length, chrome gray is the color, #3 means a 3mm wide chain, and closed end is the stop type. For craft projects (like this tablet case), use a closed end coil chain. They’re light and flexible. For apparel, use metal or vislon chains for zippers that will be exposed to the elements. Use open ended stops for jackets and sweatshirts. For partial zip-ups (like this blouse), coil chains will work and probably look the best. For upholstery décor projects (like this box cushion), a metal chain is best for cushions that will see a lot of wear or will be zipped and unzipped a lot. For pillow covers (like this quilted pillow), a coil chain will work fine. Again, there’s a lot of overlap and these aren’t “rules” but rather “guidelines”. 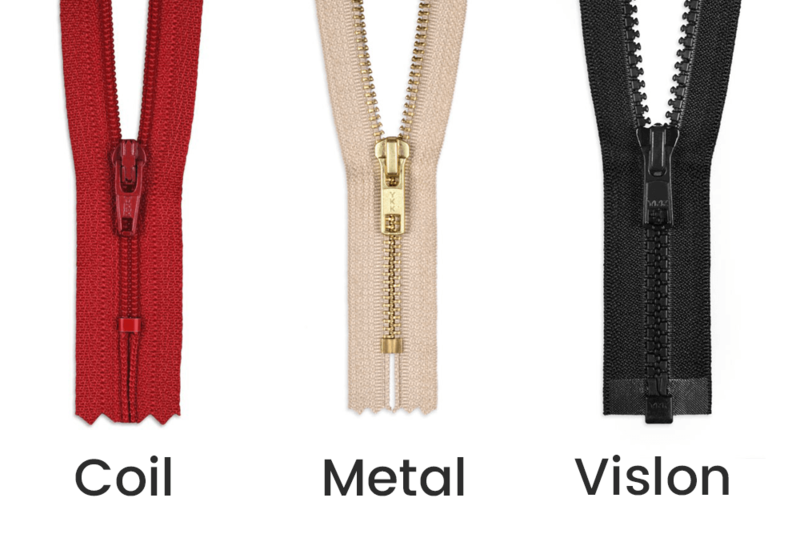 Choose your zipper based on the length, color, flexibility, and durability that you’re looking for. Ready to pick out a zipper? See our full selection here. Do upholstery zippers come in colors? BEST ANSWER: We do not carry additional colors of upholstery zippers.